Satisfying and full of flavor, you’ll love this homemade fast food meal! If you’re hungry and looking for some serious flavor without sacrificing your health, you’ll love this copycat recipe; a vegan version of Panda Express’ classic orange chicken. This is a vegan, vegetarian and plant-based recipe! 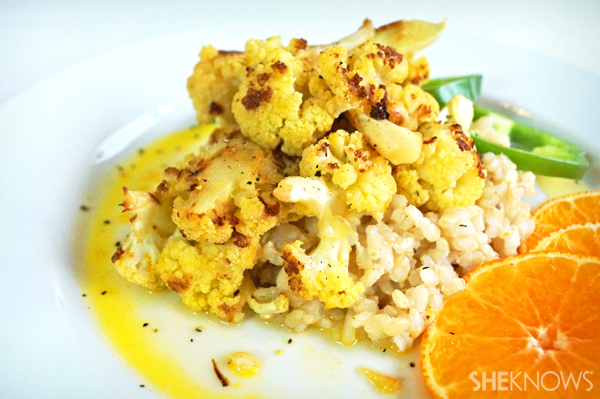 Cauliflower provides a hearty texture, brown rice is a step up in nutrition from white rice and this simple orange sauce will have you wanting to make this dish a regular dinner staple. Make extra and it makes for great leftovers to take to lunch. In a medium saucepan on high heat, add 1 cup of brown rice to 2 cups of water. Bring the water and rice to a boil and then reduce to a simmer, cover and let cook for 45 minutes. Stir the brown rice occasionally so rice does not stick to the bottom of the pan. 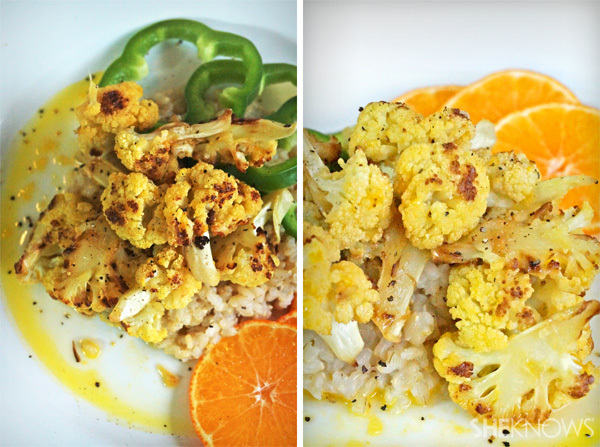 Roast the cauliflower in the oven for 20 to 25 minutes until golden brown. While cauliflower and rice are cooking, make the sauce. In a medium saucepan, simmer the orange juice with the maple syrup. Stir the sauce occasionally until both ingredients are well blended. Add the cauliflower to the sauce and simmer for 15 to 20 minutes. Serve over brown rice and season with black pepper. To finish, garnish with orange slices, green bell pepper, or any fruit and vegetables you enjoy!